While developing a Xamarin.iOS application it is essential to test it by deploying the app to a physical device, in addition to the simulator. Device-only bugs and performance issues can transpire when running on a device, due to hardware limits such as memory or network connectivity. To test on a physical device, the device must be provisioned, and Apple must be informed that the device will be used for testing. After this, the next step is to distribute the application. For more information on deployment, visit the App Distribution guides. Apple Developer Program – Regardless of whether you are an individual or represent an organization, the Apple Developer Program allows you to develop, test, and distribute apps. Apple Developer Enterprise Program – The Enterprise program is most suited to organizations that want to develop and distribute apps in-house only. Members of the Enterprise program do not have access to iTunes Connect, and apps created cannot be published to the App Store. To register for either of these programs, visit the Apple Developer Portal to register. Note that to register as an Apple developer, it is necessary to have an Apple ID. This guide has been created with the assumption that you are a member of an Apple Developer Program. Alternatively, Apple introduced Free Provisioning in Xcode 7 which allows a single application to run on a single device without being a member of Apple's Developer Program. There are a number of limitations when provisioning in this way, as detailed here. Any application that runs on a device needs to include a set of metadata (or thumbprint), which contains information about the application and the developer. Apple uses this thumbprint to make sure that the application is not tampered with when deploying to, or running on, a user's device. This is achieved by requiring app developers to register their Apple ID as a developer, and to setup an App ID, request a Certificate, and register the device on which the application will be deployed. These steps ensure that everything that is created or used during the development process, including the applications and devices, can be traced back to an Apple Developer account. Automatically (Recommended) – Select the Automatic Provisioning scheme in your project to have Visual Studio automatically create and manage your Signing Identities, App IDs, and Provisioning Profiles. For information on how to automatically manage provisioning, see the Automatic Provisioning guide. This is the recommended way of provisioning an iOS device. 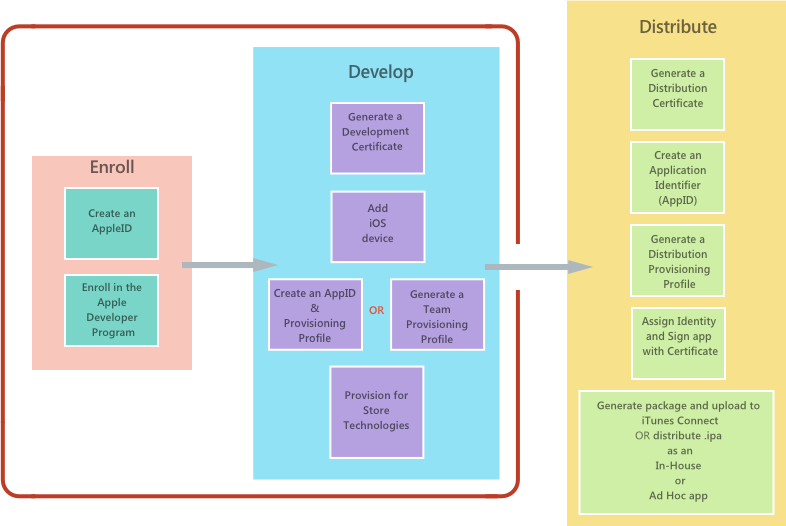 Manually – Signing Identities, App IDs, and Provisioning Profiles can be created and managed via the Apple Developer Portal, as described in manual provisioning guide. These artifacts can then be managed as described in the Apple Account Management guide. Apple provides a selection of special Application Services, also called capabilities, that can be activated for a Xamarin.iOS application. These Application Services must be configured on both the iOS Provisioning Portal when the App ID is created and in the Entitlements.plist file that is part of the Xamarin.iOS application's project. For information on adding Application Services to your app, refer to the Introduction to Capabilities guide and the Working with Entitlements guide. Create an App ID with the required app services. Create a new provisioning profile that contains this App ID.